Two new advanced locations, a solo AI opponent and a new co-op AI opponent with rules for co-op play. Also includes six red mints worth 5 mints each. Advanced locations include the Team Builder and Remover. New solo AI Hank the Leech. 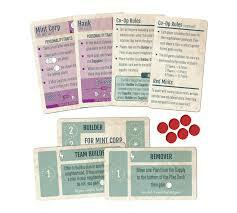 Co-op mode against Mint Corp AI includes a special AI only location and rules for co-op play. Promo released at GENCON 2017.